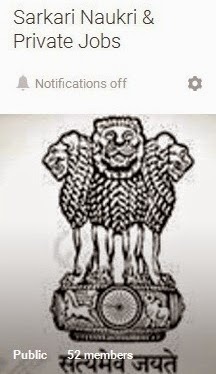 GMADA Draw 2019 Results News: Get here GMADA Results 2019 Online also GMADA Housing Flat/ Plots Draw 2019 in coming months, till you can see old circulars. Check here GMADA IT City Plots Draw June 2018 winners also GMADA IT CITY Plots Results 2018 at 10.00 am onward as here you can download GMADA Housing Scheme draw results 2018 online in coming days, till you can view previous circulars. Recently list of eligible applicants for draw of lots in IT city has been released and those who have not submit PAN have to submit to GMADA before 15.09.2016 till 05.00 pm. Earlier Greater Mohali Area Development Authority (GMADA) invites application form for allotment of 415 plots at Royale Aero City Chandigarh for 150, 200 & 250 square yards. Interested applicants have to submit online application form on or before 30.09.2015 and broadcast advertisement is available at official web site i.e. gmada.gov.in. Further detailed needed information of GMADA Residential Plots 2019 regarding eligibility, application status and application forms etc are mentioned below……………………. Draw result for Oustee category residential plots . Public Notice regarding allotment of builtup Booths. (Submit objections if any in GMADA office till 19.09.2018 500 pm). List of Applicants (Motor Mechanics/denter/painter) eligible for allotment of builtup Booths. 06/07/2018 Refund List of unsuccessful applicants (IT CITY 753 Scheme ). Revised List of Applicants (IT CITY 753 Residential Scheme Mohali). 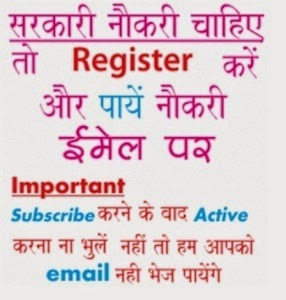 IT CITY Scheme Mohali(753 Residential). 30/05/2018 Draw result 88-89 for 500 sq yds. 30/05/2018 Draw result 88-89 for 400 sq yds. 30/05/2018 Draw result 88-89 for 300 sq yds. 30/05/2018 Draw result 88-89 for 200 sq yds. 30/05/2018 Draw result 88-89 for 100 sq yds. 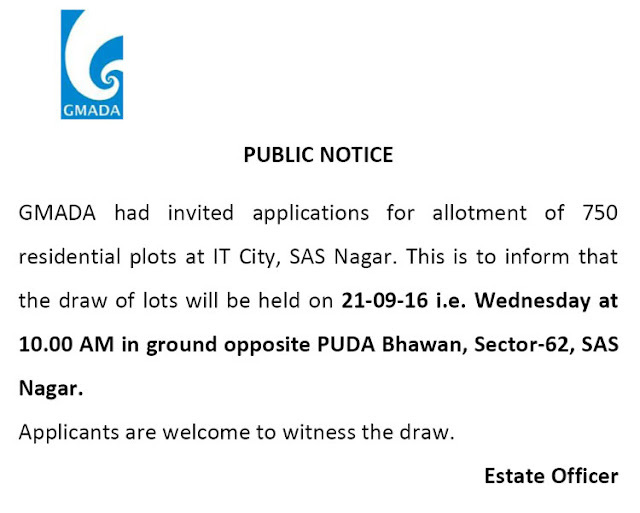 The draw of lots for allotment of 334 residential plots at Eco city under gmada are going to held at Community Centre, Sector-70, SAS Nagar, Mohali (Punjab) on 16.06.2015 at 11.00 am & 02.00 pm (new date after postpone). Applicants are welcome to attend the draw………. 14/04/2018 Public Notice Regarding Applications are invited for allotment of 1153 RESIDENTIAL PLOTS at IT CITY Mohali & URBAN Estate Gurdaspur. Interested applicants have to submit prescribed application forms of Rs 100/- available at authorized bank branches along with application fees on or before 30.09.2015, for more details visit www.gmada.gov.in. GMADA Eco City Phase II New Chandigarh Residential Scheme Results: Greater Mohali Area Development Authority (GMADA) draw Eco City, Phase 2 New Chandigarh 334 plots results now available online officially on 16 June (Tuesday) at 11.00 am (for 100/150 sq yard plots) and 02.00 pm onwards (for 200/300/400/500/1000/2000 sq yards) at web portal gmada.gov.in. Earlier gmada draw were processed on 05 June 2015 (Friday) but postponed due to administrative reasons. There are 334 residential plots 100, 150, 200, 300, 400, 500, 1000 & 2000 (Sq Mtr). More information of GMADA Results 2015 regarding draw timings, venue, refund status and how to download etc is mentioned below……………………..
GMADA Results 2015 – IT City Mohali SAS Nagar Draw Results: Greater Mohali Area Development Authority (GMADA) draw for IT City, Mohali SAS Nagar results for residential plots are now available online at gmada.gov.in. There are 325 residential plots under this housing scheme of gmada of different square yards. Applicants can view results from link given here…………. Greater Mohali Area Development Authority (GMADA) invites applications for allotment of 98 plots at Eco City Phase II New Chandigarh for 1000 & 2000 square yards. Earlier 334 Residential Plots allotment scheme launched. Interested applicants have to submit online application form as per given schedule by gmada. The broadcast advertisement is published at gmada.gov.in. More information of GMADA Residential Plots 2015 regarding eligibility, application status and how to apply etc is mentioned below……………………. Interested applicants have to submit prescribed application forms of Rs 100/- available at authorized bank branches on or before 30.04.2015, for more details visit www.gmada.gov.in.